The shocking failure of the U.S. men’s national team to qualify for the 2018 World Cup continues to reverberate around the U.S. Soccer scene. There is a malaise, as everyone knows, and change is needed. The most visible and possibly impactful outlet for the angst of the American fanbase has been the wide open election campaign to replace Sunil Gulati as president of the U.S. Soccer Federation. Most of the oxygen in the race has been sucked up by a bombastic populist with dubious qualifications, who is ill-trusted by elites and may have shady foreign backing. The ostensibly favored candidate is a woman who is clearly the most qualified, and who excites practically nobody because of her close ties to the status quo. It goes without saying that this race, which is just a couple months old, already feels like it has gone on far too long. But the more serious issue is that the campaign and wider post-elimination debate has failed to generate any consensus on exactly what needs to be done to “fix” U.S. Soccer. In fact, there is barely a consensus on what exactly — if even anything — is wrong with U.S. Soccer in the first place, besides the obvious failure to book a ticket to Russia. The most persuasive argument might actually be that nothing much needs to be changed, at least when it comes to the national team. The Yanks’ elimination came through an extraordinarily absurd series of events, that included both Panama and Honduras upsetting Costa Rica and Mexico, the former through a phantom goal that never occurred and the latter through a couple of fluky goals. Meanwhile the U.S. allowed two highly unusual goals of their own. Even then, the USMNT finished the Hex with the third highest goal differential, and on 12 points, they finished better than Mexico did in the qualification cycle beforehand, when El Tri was saved from a similar ignominy by a late American rally against Panama. The Mexicans proceeded to make the World Cup and impress, showing that their qualifying cycle woes could be corrected simply by better coaching and different players. Need the U.S. blow everything up? The future of the USMNT player pool also suggests there’s plenty that’s going right with U.S. Soccer. 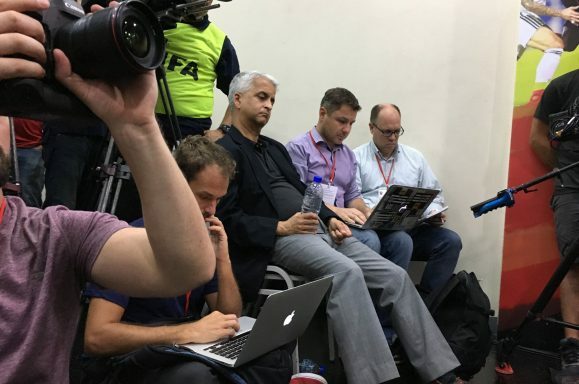 Even before the defeat in Trinidad, soccer writers were covering the lost generation of youth players who had failed to make good on their promise. The 2017 USMNT then, was carried mainly by players who would’ve been replaced by younger players, had those players been good enough. The fact that they weren’t is a damning indictment of U.S. Soccer… in 2007-2012, when these players were graduating from youth to senior ranks and failed to progress. But there’s no such evidence of a similar drought now, with a wave of impressive young players maturing both domestically and abroad. Whatever ailed American soccer development in past years may well have been already corrected, if Christian Pulisic, Weston McKennie, Tyler Adams, and others are any indication. Meanwhile the nation’s flagship domestic league, Major League Soccer, is seeing growing attendance numbers, increasing investment, and improving quality. The league’s turnaround from near-death is taken for granted now, but it shouldn’t be. Not too long ago, the failure of the USMNT to make the World Cup might’ve proven disastrous for the league. Now, it’s not even a question that it will survive and continue to grow. Against this backdrop, the USMNT failure seems just a bit more, with the benefit of hindsight, like the kind of once-in-a-few-decades slip up that befalls even such storied soccer nations as Italy, the Netherlands, and Chile. This is not to say that U.S. Soccer is without issues, or that it did not inflict its own wounds. The management of the USMNT looks dreadful in hindsight, with Jürgen Klinsmann being awarded an unearned extension, then unceremoniously fired and replaced by Bruce Arena, whose steady hand on the tiller was a bit too sclerotic. It remains stupidly expensive to get a coaching license in the country, and the pay-to-play youth academy system forecloses unknown numbers of talented but poor youth from elite training. The management of the USWNT also leaves a lot to be desired, and issues about compensation and respect seem far from resolved. Lower division teams are still folding at unacceptable rates, and an entire league may soon follow. At the youth levels, there’s a whole forest of grievances and infighting that largely go unmentioned in the wider soccer media. The next President of the USSF will rightly face pressure to make more progress on these kitchen table issues, even if that means a little less progress is made for the game’s investors and other monied interests. But no candidate for the office has made a believable case that larger baby-and-bathwater reform is needed, let alone how it would occur. There are too many hobby horses in the American soccer scene, and when the USMNT failed its qualification, each one was trotted out and linked, however tangentially, to the team’s failure. The effect of this — as has repeatedly been the case thanks to advocates who have done far more harm to their causes than good — has been to discredit these ideas and give way instead to a mishmash of noise, with opportunists and malcontents getting their say and little progress being made publicly on important discussions. We are left instead, with inanity like this strikingly dumb Deadspin attack on MLS expansion, in which the league’s growth is the confusing scapegoat for the USMNT failure, and is apparently the only sports related item that this sports website thinks “needs to die” in 2018. How exactly building wildly successful new clubs and pro academy structures in major American metro areas is supposed to be a detriment to the national team is left unexplained. (What does the author think about Atlanta United’s academy winning the U-15/16 USSDA national title? Does the author think that Atlanta’s star youth players Andrew Carleton, Chris Goslin, and George Bello would be better developing in the NCAA? Without MLS expansion which team would’ve signed Brandon Vasquez instead?) It is as if through through sheer dissatisfaction alone, American fans ought to arrive at the answer. In a small way, Deadspin‘s famous and bewildering grudge against MLS is good evidence for one of the biggest maladies affecting the American game — one that we should all at least be able to agree upon. Here is one of the country’s preeminent sports websites whose coverage of the top American soccer product is marred by fits of pique. Why? American soccer fans pull together impressively in support of the men’s and women’s national teams. But in all other matters of practice and policy, there is disunion. Plenty of American soccer fans only watch the game on TV at 9 a.m., and plenty of others only watch it at the stadium at 7 p.m. What vision for American soccer binds these fans together? What should be the position of America within the global soccer world? What should be the position of MLS within the global soccer world? What will the men’s American professional pyramid look like in the future? How many teams are enough for MLS? If it reaches such a limit, what happens then? Can league structures be reformed in a generally beneficial way? What is the correct model of growth for the NWSL? What is the best way to sustain the careers of the USWNT players? What long-term role should the NCAA play in both the men’s and women’s games? How can youth development be made less costly and parochial, while improving the coaching of elite talent? These are vital questions about which there will always be passionate argument between even friends and allies. But what is so profoundly unproductive and frustrating is that the universe of American soccer fans don’t seem to be on the same side just to start. Several U.S. Soccer presidential candidates — and certainly some of their supporters — seem actively antagonistic to MLS and would blow up the league’s entire structure if they had the chance. Several U.S. Soccer presidential candidates — not to mention its current leadership — seem completely uninterested in leagues besides MLS and give no indication they would lift a finger to save them from trouble. Many Americans want to see American stars develop out of MLS, and many others seemingly just want the best of their countrymen to magically identify themselves and proceed directly to Europe. Is leadership of this polity possible? Where is a unifying voice who can speak to all sides? What is a unifying theme? I watched Minnesota United FC all of 2017; I know what it looks like when different players have their own agendas, and commitment to shared success is suspect. It’s not a recipe for lots of wins. Yet while the Loons can make significant changes during transfer windows — or not, I guess, it’s a free country — the true problems with U.S. Soccer, the deep underlying ones that transcend qualifying cycles and seasons, seem as intractable and elusive as ever.